Displaying 1 posts matching `translation`. Show All Posts. 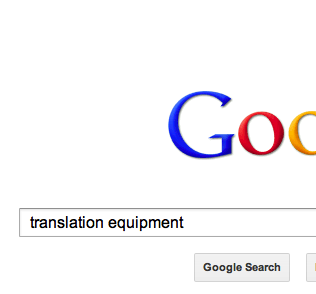 "translation equipment" is one of the most popular terms that people type into their favorite search engine when looking to rent an interpretation system for their conference or event. Let's look at some of the questions that this search term implies, and make clear some of the other terms that are used in reference to conference interpretation. Although the terms are used interchangeably by the layman, in the language industries the specific skill of verbally transitioning from one language to another is referred to as interpretation. Translation is only used to describe the act of translating the written word. Interpreters and translators are two distinct sets of people with two specific skill sets. To help differentiate the terms and understand the distinction it is necessary to look at the difference between written and verbal communication. Writing is generally something that is understood to have involved an element of editing by either the author or a third party. Consequently, written translation is intended to be a 100% accurate representation of the original text. Verbal communication on the other hand often involves an element of inference or implied meaning on the part of the speaker. It is therefore necessary that the meaning be interpreted into the target language rather than literally translated in order for the actual intention to be accurately understood. Often the person doing the searching is unclear as to whether technology has advanced to the point that verbal translation is something that can be achieved by a purely technological solution. Whilst great strides have been made in automated translation in the past few years, we are still many years from the point where a highly skilled interpreter can be replaced reliably by a machine. As such conference interpreting is practiced by teams of qualified simultaneous interpreters, usually working in pairs per language. Their ability to work accurately and at speed is facilitated by specific equipment that enables them to deal both with quick changes of direction, or with the floor language of a multiple language event changing. Simultaneous interpretation is the act of converting in near real time from one language to another. This involves utilizing microphones and interpreter consoles to relay the source language to the interpreters who are located in a soundproof booth. The audience then listens to the interpreters via earpieces in their native language. This transmission is normally accomplished via either IR (infrared) or FM radio receivers. Consecutive interpretation on the other hand is not immediate. An interpreter will stand next to and listen to the speaker and interpret directly on a sentence by sentence basis, while the speaker waits for the interpreter to finish. This form of interpretation naturally involves a doubling of the length of time it takes to convey the information to the audience and is consequently normally only used in informal, intimate settings, for very short amounts of interpretation. You may be wondering what exactly happens if a variety of people will be speaking multiple languages? How can be that interpreters can manage to convert from multiple source languages into their native target language? Do they really have to be able to know every possible language pairing they may encounter? The answer is relay interpretation. A common language, normally English, is used as the floor language. Let's take for example an event with Spanish, French and Russian interpreters and English speakers on stage. Normally all the interpreters would be interpreting directly from English into their native language. In the event that a speaker needs to speak for example Spanish, a Spanish interpreter would reverse and interpret into English. The Russian and French interpreters would automatically be switched over to listening to the English feed coming from the Spanish interpreter which they would then seamlessly continue to interpret into Russian and French. Upon the Spanish speaker finishing and the floor returning to English, the system would revert back to its normal condition. Only a few systems in the rental market are able to provide this functionality up to 32 languages at once, an example being the Bosch DCN Next Generation system. The system enables seamless communication by removing the high chance of error or confusion that might otherwise naturally occur when dealing with multiple language combinations.